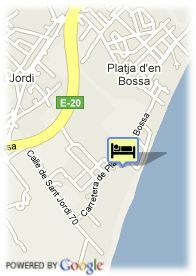 Crta Playa d´en Bossa, 10, 7817 Playa D´En Bossa, Spanje. Fiesta Club Playa d'en Bossa is the ideal hotel for young people who want to enjoy an unforgettable holidays Located on the popular Playa d'en Bossa beach (one of the most famous on the island) the Hotel is just in front of one of the island's most renowned discotheques and very close to the biggest water park in Ibiza and many other leisure spots. This hotel is not recommended for families with children under the age of 12. Fiesta Club Playa d'en Bossa is notable for its bungalow-type buildings, featuring a maximum of 3 storeys and typical architecture of the Mediterranean islands, and its large pool. It is right on the seafront and its perfect location allows for quick access to the Ibiza town centre (3kms) and to the airport (4 kms).